With tens of thousands of songs available and mobile broadband capability, we can download any track as we DJ! We always ask our clients for a preferred playlist before the event so we can guarantee to have everything you want to dance to at your party. We’ll be set up before your guests arrive and play great music until the party has finished. Using a combination of theatre and disco lighting, we create a fantastic atmosphere for your guests to dance in. 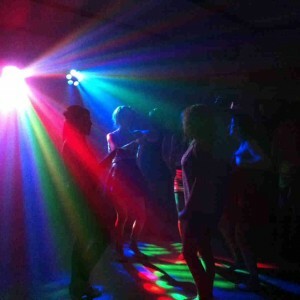 We also include fog (venue permitting) to enhance the lights and give a real disco feel. From booking to performance, you’ll only have to deal with one person – far easier than haggling with a band and separate party DJ. We’ll liase with the venue to arrange set up times and requirements and meet with you to discuss your song choice and requests. All our equipment is PAT tested and we have backup systems available if needed. We carry public liability insurance (required by most venues) up to the value of £2million. We have a wealth of entertainment experience to ensure your event runs smoothly and successfully. If you have something in mind that we haven’t mentioned, get in touch! We’ve created unique entertainment for theatres, holiday parks, hotels, cruise ships and wedding receptions and are confident we can provide just what you need!